Sonia has a few quirky allergies that come and go mysteriously. One is to mushrooms. Although, that particular sensitivity didn't apply when it came to the Portobello Mushroom Fries. Another one of her fun "come and go" allergies involves certain kinds of shellfish. Maybe. We've figured out she's okay with crab and lobster. But she usually plays it safe with things like clams, oysters, and scallops...except when my dad orders the fried oysters and she takes a couple bites. Maybe she's grown out of the allergy and maybe she's not as sensitive when the food is prepared a certain way. Who knows? But it took some convincing to get her to try this paella. She finally agreed, but only on the condition that I take all the mussels out of her portion. That was just fine by me, because I really liked these mussels. They came out nice and soft, but not too chewy. The "calamares" were by far the chewiest ingredient in our bag. I've had squid before that was not this chewy, but really, it wasn't horrendous—just a tad more rubbery than I would have preferred. The rest of the textures were wonderful and blended together seamlessly. 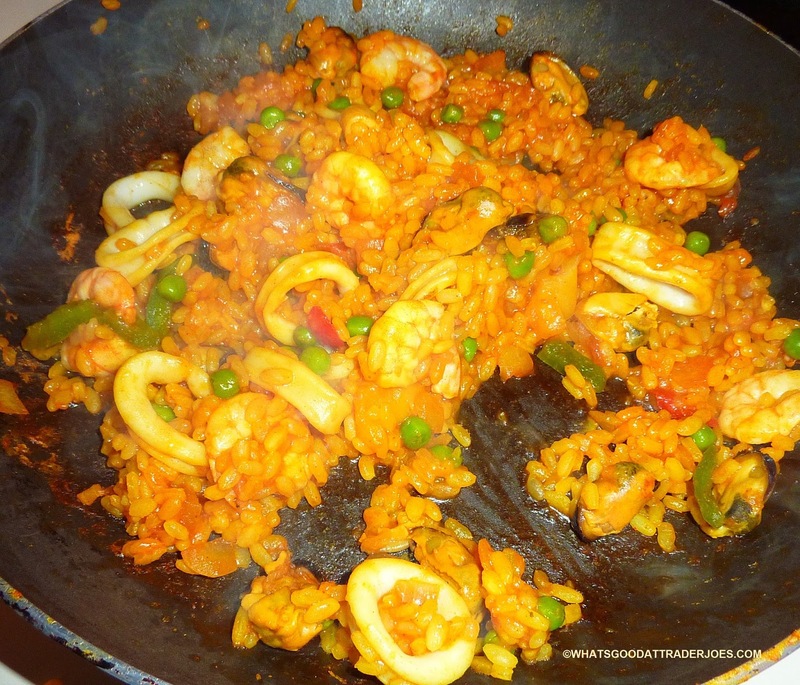 South Jersey is full of fresh seafood, but I haven't seen many places around here that offer any kind of paella. In fact, the only other time in my life that I've had proper paella was in Spain. There was a quaint sidewalk cafe in Madrid where I tried this "national dish" of España. It was a while back, but honestly, I remember not being impressed. 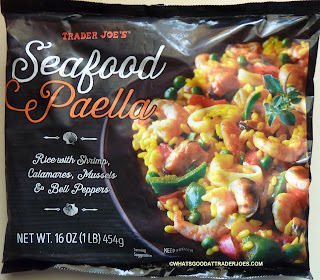 It was much soupier than Trader Joe's offering, the vegetables were stringy, and I felt it lacked flavor. They might have given me a bad batch on purpose, though. They didn't seem fond of non-Spanish speakers there. <Sigh.> Six and a half years into a marriage to someone whose first language is Spanish, and I'm still trying to learn it. But back to the paella. It's good. It's complex, flavorful, and not-at-all-fishy. Seafoody? Yes. Fishy? No. I'm not sure how authentic it is, but I certainly prefer it to the only other paella I've ever had. Ironically, this selection is a "product of France," not Spain, according to the bag. Eh, close enough, I guess. Four stars from me. Three and a half from my better half. 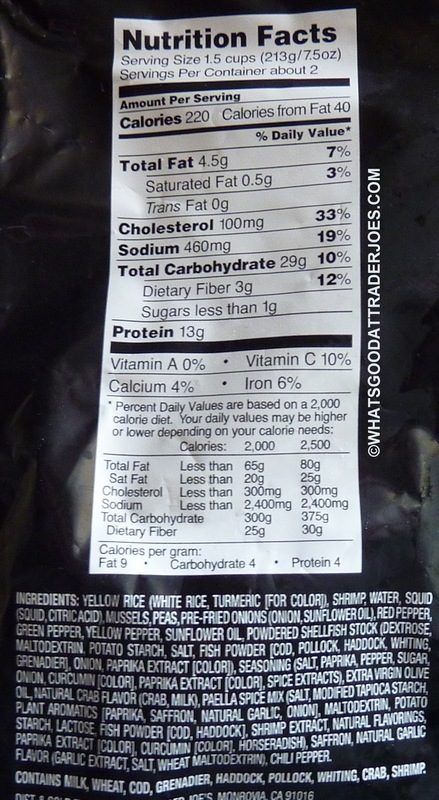 Maybe they couldn't find a supplier that can make paella without GMO's or bidding process to get sold in store. 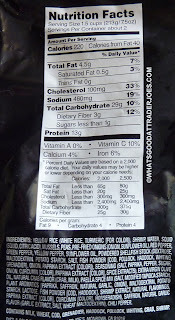 Does the rice get caramelized/crunchy like with traditional paella? I used to have a come & go allergy to seafood-mainly shell fish, but no longer bothered by it. My solution, I took the advice of someone who had similar bouts of it and she suggested that I do not drink wine when having the fish. Lo and behold it worked!!!! Maybe too much sulfite at one time??? I have to say I tried this and found it revolting. And I'm a big fan of paella. And most paella can be 'safe' for those with lactose allergies EXECEPT this one. It contains lactose and milk added to make the crab more 'tasty'.... Paella usually contains no added milk, except cheese, if added by the patron. I spent the day on the pot. In the future, just make my own, how frustrating. Why did you try this, then, when the bag has "CONTAINS MILK" printed on it? shrimp are like little rocks. not edible. I think you overcooked it, then. I just tried it and it was quite good. Shrimp tender, calamari not rubbery. 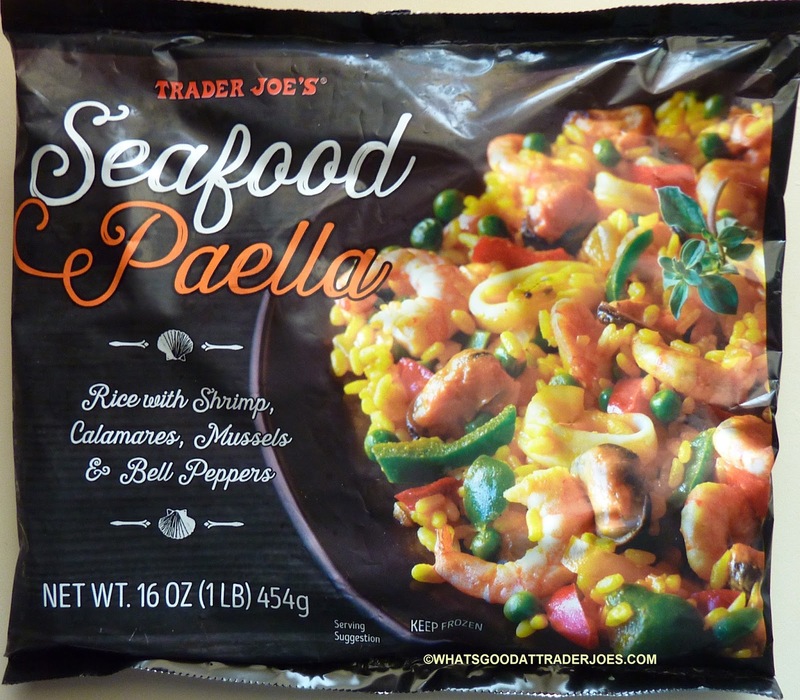 OMG I love Paella and so glad I found this at TJ’s. I bought one just to try it out and I was blown away on how yummmy this is. I ended up going back to purchase more and again a few days later. I need this in my feezer and can eat this every other day!! I just tried it for the first time. And I think it is very good. The texture was perfect. The calmari wasn't too chewy. If it was for you, then you probably cooked it too long. quick easy and onion free. all pluses in my book.